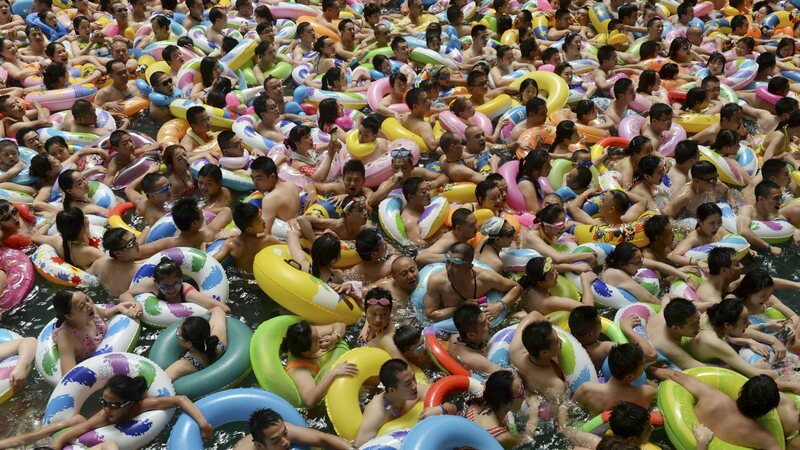 And here are mostly underwater Chinese crowding through a tiny exit. Can you spot the difference? In next week's edition, gold traders re-enact the final scene from The Italian Job. Anyone that has studied their history should know , and you should know of all. Money lost , nothing lost, confidence lost , everything lost..Goodbye London metal traders. Kind of mean coming from a CT resident! If your point is that the Chinese are uniquely susceptible to a herd mentality, you may yet be surprised by what our countrymen are capable if s@3t truly hits the fan, which it really hasn't for a few decades - and no the GFC doesn't count - we were pulled back from the precipice quite in the nick of time. The truth or dare between the dollar and yellen is quite worthy of cinemax (please no one start with the buck naked jokes) - feel like this nice little multi currency playground everyone's been frolicking in since 1985 may need to be shut down for maintenance - just in time for a few kids who wanted to take their toys and go home anyway. I sound more and more like amp everyday. I'm so bored waiting for the sell programs to flush every long from the equity markets. Can you please all puke your positions asap, so I can buy your margin liquidation? Thx so much. Another beautiful Monday morning as viewed from the Hammock. Once again, last night's action shows that markets, especially emerging markets, are largely uninvestable - at least until such time that the China bubble has relaxed back to the strip of bubble gum it was before all the blowing started. Dollar dynamics will be quite interesting this week, but the real haven currency most closely connected to the panic button is probably the yen, driven by what happens in the rest of Asia. There is a point of view out there which states that the Shanghai market isn't really that important to China's economy (unless you happen to be an unfortunate small investor) so the rest of the world won't freak out. The unknown at the moment is how much pain is gradually spreading into other emerging markets and the pockets of large global equity fund investors. At least after the last two decades we understand a lot about the mechanisms and how the contagion occurs. (Cough: BUCKY). 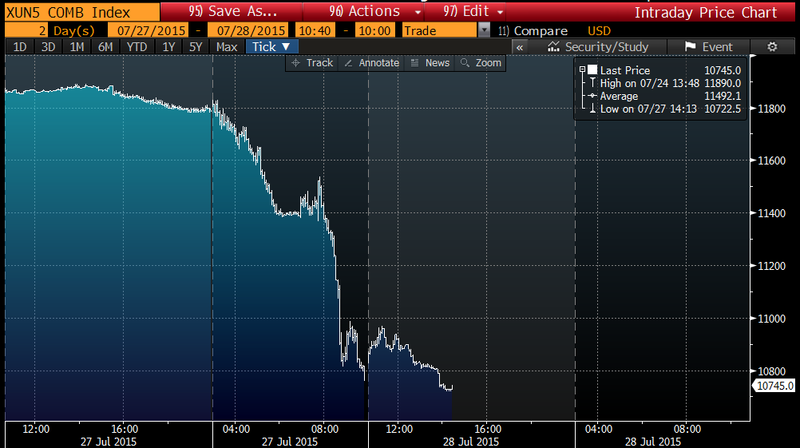 I think that sound I heard this morning was PROC/PBOC backstop of SHCOMP et al going down the toilet. The $spx internals are not looking all that pretty here either, Fridays dump took a significant toll. If I recall, last time we were here some FED mouth piece was chatting up the market. FM bought those margin liquidations. Half off: NQ +40 ticks (twice), YM +40, ES +16. Run the rest. 2 chances. Closed another 1/4 of posn. NQ +100 ticks, YM +60 ticks. 1/4 posn left, stops at BE. Have a good afternoon. Chinese equity should have an epic squeeze now. The first half of '15 was just a tease. Latest part of the puzzle: the IMF told ECB to continue QE beyond Sep 2016. Earlier they told Fed to wait and BOJ to expand the program. It's pretty clear now that these guys are really going to go ALL IN until something happens one way or the other. Only the Fed is in a difficult conundrum with their communications policy atm but I'm sure that will resolve itself out within a year from now. I wonder if there's the law of diminishing returns starting to apply here. How far are we from the point where increasing the input of debt starts producing negative output of GDP? "Another beautiful Monday morning as viewed from the Hammock." Indeed, I would be lying if I told you that the PnL wasn't leaking in a couple of places, but the decision to short some FTSE and up the cash levels at the end of Q2 was surely the right one! The thin summer market of Q3 is once again proving to offer slings and arrows. I share the sentiment above, this isn't over. No need to be a hero here, hang tight ... it could get worse. A bottom in October comme d'hab? As for China, I do think it is all a bit overblown to be honest. It looks scary be we all knew it had to deflate; no real news here. The key thing for me is really whether China manages to convince the world at large that its growth is simply on a smooth downward "glidepath" or whether it is indeed crashing as I type. And the answer to this question still lies in credit and capex data. Yellen is in a tricky spot here. Does she stick to the script or fold. I mean, it is very likely that NFP and DM inflation data continue to chuck along nicely (e.g watch EZ CORE inflation this week for starters) even as market punters are suffering trials and tribulations. Late cycle, chaps ... it aint easy! FM, you are scalping from the long side and nothing more. Your trades are not relevant to any discussion of a JBTFD mentality prevalent in today's markets. You can just as easily say that you are selling every rally. I honestly can't believe that there is anyone who reads this site on a regular basis who has the slightest interest of your intraday p+l. All the best with your trading but it is boring for everyone else. @JohnL. Internals are horrible here, check out HYG as well. This smells of liquidation. But also reminiscent of 2011. with a long period of consolidation and then boom a large breakout. Below 2050 I think the bids dissappear unless Yellen conjours up another round. Thinking of hitting mr yen for some insurance. "I wonder if there's the law of diminishing returns starting to apply here. How far are we from the point where increasing the input of debt starts producing negative output of GDP?" Interesting question - need to look at each type of debt differently - I think we are past that point for every equity sector in the US, as their contributors to GDP, namely retained earnings, capex, or employee wages have been more or less stagnant or coming down with higher leverage) - the possible exception could be mega tech, but their starting leverage was very low (or as in the case of AAPL, nonexistent). I think the issue is aggregate demand - more debt improves GDP if its used in a way that increases immediate spending power, such as through infrastructure capex or tax breaks for lower income people - the vast majority of new debt in the last 3-4 years has been for buybacks, or to the extent QE cheapens borrowing costs for DM, just enabled govt deficits to be funded cheaper than they otherwise would be, with no clear endgame for what actually happens to those interest 'savings'. China used to be the poster child for higher debt = higher GDP, but they've been needing 3-4$ of GDP for every new $ of GDP in the last 2-3 years - hard to see the relationship actually turn negative, more likely because their debt will start decreasing in a stagnant, deflationary economy as the PBoC sweeps and forgives everyone's debt - here the outcome is more likely a lost decade in GDP growth as opposed to increased leverage. Long winded answer, but i do think its the question of the millennium as far as Im concerned. Interested in other people's thoughts on the subject. I've seen similar discussions and don't agree with them. The idea is that "stocks are underowned by the general population" - but thats not the primary transmission mechanism that causes financial markets to reflexively interact with the real economy. What impact will this market and govt response have on foreign investment in China? How has the typical chinese firms cost of capital changed? Are firms more or less likely to be hiring? Simply taking the stock market decline and overlaying that onto consumer spending is missing substantial multiplier effects. China "hard landing" (whatever that means to you) scenarios should be on the forefront of everyones playbook. Lets say in the fall we start to see defaults in the HY energy space. What would policy response be? Mr T. I doubt we will see defaults in the energy space. But for sure lots of companies breaking covenants when their reserves are re-stated with a likely lower oil price. That should be a nice wakeup. But remember Blackstone et all have lots of 'dry powder' waiting so its tough to say. What we do know is Saudi is pumping like crazy. Looking at HYG attribution on the berg, energy bonds accounting for 95 of the 105bps fall in returns this month. Down almost 7 points per bond but I'm not seeing any babies bieng thrown out yet. Turing towards equities, we have materials and energy ugly, transports ugly, semi's ugly, small caps sorta ugly. If either big tech (ie software not semi) or financials start rolling over this is gonna be a big sell off. "Lets say in the fall we start to see defaults in the HY energy space. What would policy response be? " Why would there be any policy response? if the energy sector disappeared tomorrow, thereby relegating republicans that are funded by energy tycoons to the dustbin of history, it would suit the policymakers in washington just fine. These aren't financial institutions that need to be saved - they have failed plenty of times in the past and will continue to be cyclical. How did China's stock market crash affect the real economy? Let me give you an anecdote example. One of my friends owns a small event planning company in a third tier Chinese city. The cost of bank/shadow bank loan is always too high for him. So he usually relied on his own capital, loan from family members, and supplier's credits. In late June, after the stock market crashed, a portion of his capital was frozen in suspended stocks. So when he had to make a deposit for a winning bid of a new business contract, he had no liquidity. His relatives and his suppliers all had their money frozen in the suspended stocks or took large losses. Of course, my friend was able to eventually find money to make the deposit by borrowing from friends who were not hit by the crash. So in the last two weeks, once the suspended stocks began to trade again, my friend liquidate all his positions with a small loss. Overall he still has a profit from stock markets since 2014, but a much smaller one. DeMark said he’ll reassess the market once the Shanghai index hits 3,200, which would almost wipe out this year’s gain. If that level, which is around the 61.8 percent Fibonacci retracement from the June peak, fails to hold, the market could “unravel” quickly, he said. Some technical analysts use Fibonacci ratios, based on proportions found in nature, to predict stock market levels. Abee- the 2011 period was the qe2 pop and drop, I'm thinking that based on the degradation of internals we aren't in a consolidate. Now if Janet hops into her broomstick. ...that could change things. Your exchange data feed has a built in delay to allow HFT firms to screw you. @FM - Good call on long equities, up over 1% from your levels yesterday. Skippy, has been having some hammock time in Spain. But has been pondering the ongoing move in China. While the move in Chinese stocks and commodities might suggest something about global growth, it is not obvious that this is consistent with the macro facts in the U.S. and Europe. That said, it is difficult to quarrel with price itself. The observation today by the sooth sayer is probably correct. Chinese stocks probably have to correct a bit further.